Yet another module for the world's most popular screensaver After Dark. The program features the original cast, great sound effects, and diverse modules to make staring at the monitor more entertaining. 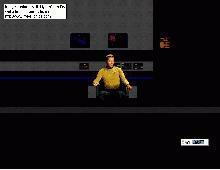 Not as informative as LucasArts' Star Wars Entertainment, but still a great value for all Trekkie fans.